1) One of the most important pillars of Islam. 2) A principal means of obtaining proximity to the Almighty. 3) One of the most difficult physical forms of worship. 4) So, vital that one who does not perform Hajj will be barred from Heaven. The main aim of human creation is to recognize God and attain a stage of acquaintance and love for Him and this depends on the purity and loftiness of the human soul. i.e. The purer the soul becomes the more love will it have for the Almighty. This stage of love can be attained by abstaining from desires and refraining from worldly pleasures and distractions, and by exerting oneself in the rigorous self-training activities for the sake of God, and, remembering him continuously. For this purpose the Almighty has legislated certain forms of worship (Ibadat). a) Those involving the expenditure of wealth for His sake e.g. Zakaat and Khums which serve to sever the deep attachments to worldly possessions. b) Those involving abstinence from desires and pleasures e.g. fasting. c) Those related to His remembrance and diverting total attention towards Him e.g. Salat/Namaaz. iv) Renewal of the covenant with God. And others like throwing pebbles, running between Safaa and Marwah etc. Those who wonder at these actions do not realize that when we do not know the hidden meanings and reason of certain commands, we manifest more complete obedience and total submission to the Absolute Master in carrying out those orders. Those actions whose secrets we have been successful in understanding, our soul, besides obeying the Master's commands, is also inclined and pleased in performing them. Thus, it is only for Hajj that the Holy Prophet (S.A.W.) 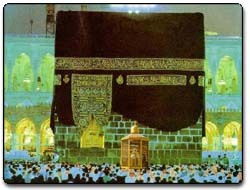 is reported to have said, "O Almighty, I have responded to your call for Hajj with complete submission and humility." Furthermore, the Hajj constitutes the congregation of people from all parts of the world, in the place where revelation was repeatedly sent down to the Holy Prophet (S.A.W. ), where the beloved (Khaleel) of God resided, where angles used to descend every now and then. In fact, it is the holy place, which has been the abode of the majority of the Prophets. Here the leader of the Holy Prophet (S.A.W.) was born, his holy feet walked; and the Almighty has chosen it for His house so that people should pray towards it. He has sanctified its surroundings and has kept Arafah in the beginning of the Holy Land. He has prohibited hurting animals and uprooting vegetation there in as a mark of respect to the holiness of the land. He has designed it to be like the throne of Kings so that visitors from far off lands, disheveled and dusty, should remain there in humility to the Absolute Monarch realizing the fact that He is above all needs of time and space. While such a congregation leads to new acquaintances, meeting with virtuous personalities and stimulates quicker response to supplications (Dua), it invariably reminds of the Holy Prophet (S.A.W.) and his efforts at spreading the Word of God. In this way one attains purity of the soul.